The rules of skiing are listed in the Skier's Responsibility Code, which is posted in a number of locations throughout any resort. The code was created in 1966 by the National Ski Areas Association. In recent years, due to the growing popularity of snowboarding, some resorts have begun to call this "Your Responsibility Code." Whatever you call them, these important rules of skiing are crucial to slope safety. In fact, if you disobey them, you can get your lift ticket or season passed pulled by the ski patrol. Although the words may vary from resort to resort, all ski areas are required to display some variation of the Skier's Responsibility Code. This is the original version, which was created by the National Ski Areas Association. Safety on the slopes is everyone's responsibility. Ski safely-not only for yourself, but for others as well. Control is an important slope safety issue. To stay in control, you must ski in terrain that is within the range of your ability. In fact, some resorts actually add this to the Skier's Responsibility Code. Just like the driver must know how to step on the brakes if someone crosses in front of the car, a skier needs to know how to stop if a person or object crosses his or her path. Stopping involves turning the skis far enough up the hill so that you can come to a complete stop. This technique can be learned by taking ski lessons. Unfortunately, the concept of "right of way" is often ignored. It is also controversial, because the rules of skiing also state that you should not stop where you can obstruct a trail. While the uphill skier has the responsibility of skiing with enough control to avoid hitting you, if you suddenly stop to have a conversation in the middle of the slopes, you are equally in the wrong. Always move away from the fall line if you need to stop. 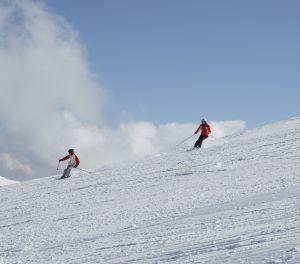 Often, a ski resort will have two slopes that merge into one. In some cases, such as Whistler/Blackcomb in Canada, an advanced trail is merging with a beginner trail. Since the advanced skiers are usually skiing faster than the beginners, it's important to either allow the faster skiers to merge first if you are a slow skier, or slow down to let the novices merge if you are an advanced skier. The ski boundaries, as well as the "area closed" signs are there for a good reason. In some cases, the area might have extremely thin cover. In others, there might be a special event, such as a race, that will happen in the roped off section. Certain areas are more prone to avalanches, and others are simply not within the resort boundaries. If you have an accident in any of these roped off areas, the ski patrol will not be responsible for your rescue. Some of the worst accidents happen while getting on or off a chairlift. For safety, do not ski forward until the lift operation team tells you to do so. Ski to the designated line, and when the lift arrives, sit down. Always put the safety bar down. When the lift reaches the top of the hill, do not get off before the designated unload area. If you feel that you are about to fall, do not, under any circumstance, attempt to hold on to the person next to you. If you do fall, roll so that you can get out of the area as soon as possible. Remember, these rules of skiing are not merely suggestions. They were created by people who studied the most common reasons for ski accidents. As such, they should be followed.